With back-to-school in full swing, I know many of you have been packing healthy and tasty meals for your kids–or yourself! Luckily, EcoChildsPlay is full of great tips on packing just those kind of lunches, whether it be recipes your kids will love, or containers you know are safe for your kids. 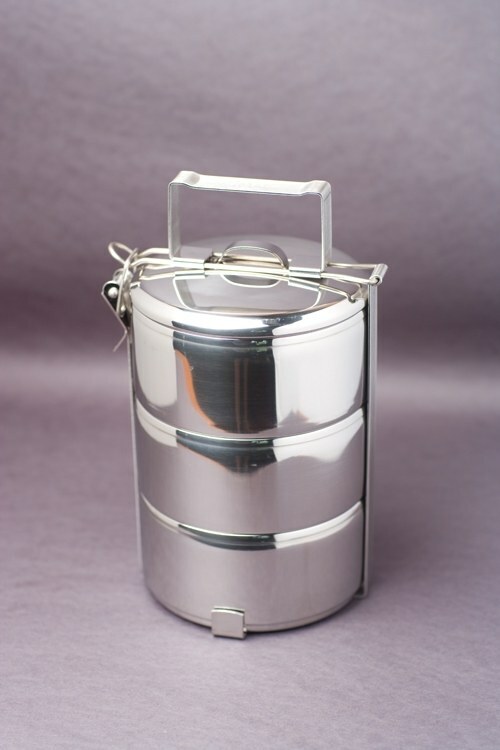 The folks over at Healthy Kitchenware are doing the same thing by featuring plastic-free products for your kitchen and lunches, including these stylish tiffin-style stainless-steel food carriers. The best part? You can win one! Find out how, after the jump. What’s your favorite brown bag-less lunch? We’ll use Random.org to generate a winner based on all eligible entries between comments here and over with the food-lovers at Eat Drink Better. Comments will close at noon CST this Friday, September 12th. The winner will be announced Friday afternoon. The winner will receive a free three-tier stainless-steel food carrier like the one pictured above courtesy of Healthy Kitchenware. And while you’re waiting, check out all the great tips from EcoChildsPlay for packing safe and healthy lunches for your kids in our Related Posts below. A nice green salad w/ plenty of veggies and chopped chicken, topped with crushed almonds and organic ranch dressing. Love that store — and leftovers (lasagna, enchiladas – but those are more thermos items). For the tiffin? I’d pack some tabbouleh, hummos, and stuffed grape leaves, and then some fruit on another level. Got my mouth watering already thinking about lunch! Looks like a great way to carry a lunch. Carrot sticks with peanut butter, an apple, and rice balls (made with fresh-cooked brown rice and a mixture of shredded nori and sesame seeds)–yum! a favorite lunch: fresh tomato slices with fresh basil, cold salmon/noodle salad and pickles or olives on the side. LOVE this lunch “box”. I would pack this for myself, my husband or my son! Fill one tier with lots of fresh fruit, the second tier with veggies and cheese, and the bottom tier with a leftover main course from the night before! Perfect! MMMM….good. Takes me back to little kid school day lunches like mama used to make. I LOVE this lunch box. I teach Art at an elementary school and this year we are pledging to go green. I just did a lesson on eco-friendly lunches and I can’t wait to show this to all 774 of my kids. They will LOVE it. As for my lunch I would put bruchetta on one layer, fresh fruit on another, and a little chocolate on the top. My favorite brown bag lunch has to be veggie sushi! Easy, portable, and eaten well by everyone in my family! I love peanut butter and jelly on whole wheat bread. It would be potato soup, some fresh tomato basil sandwiches and lusicious blueberries and peach slices for dessert. We pack our lunches in reusable containers and have a really cute lunchbox that came with it’s own silverware and salt and pepper compartment! I love to make shredded chicken taco filling with lots of cilantro and have a cold lunch of chicken tacos with cilantro lime sour cream or guacamole. I freeze water in my reusable water bottle to keep my lunch cool and so I have cold water to drink at lunch time. And of course, a cloth napkin is a must. People always say “ooooh, aren’t you fancy..” No, I just like reusable napkins, thanks! During the summer months, a fresh salad with veggies from the farmers’ market and some feta or bocconcini cheese. During the winter, leftover chili or shepherd’s pie. We free lunch-size portions in reusable containers so they’re ready to pack! A few bananas and natural peanut butter on another layer… maybe some apple slices.